Coach Haege was a graduate assistant defensive backs coach at Northern Michigan University in 1966 when Rollie Dostch was Northern Michigan's Head Football Coach. 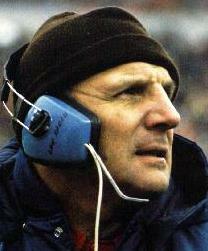 Rollie Dostch went on to win four Super Bowl Rings when he was the Offensive Line Coach for the Pittsburgh Steelers in the 1970's. 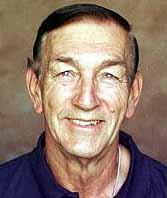 Roger French, long time Offensive Coordinator at BYU in the late 1970's and 1980's, and when they won the National Championship. I have a copy of a letter of recommendation Coach French wrote for Coach Haege in the 1980's signed Roger French, Offensive Coordinator. Coach Haege coached with Roger French at the University of Wisconsin in 1969 and also ran a QB and Receivers football camp with him in 1987. 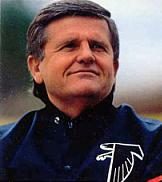 Jerry Glanville, former Head Coach of the Atlanta Falcons and Houston Oilers. 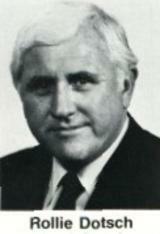 Coach Haege coached with Coach Glanville at Northern Michigan University in 1966. Carl Reese, former Defensive Coordinator at LSU, Missouri, and the University of Texas. Coach Haege coached with Coach Reese on that great Northern Michigan University coaching staff in 1966 where they were both graduate assistants. John Gregory, former Head Coach of the Saskatchewan Roughriders of the CFL when they won the Grey Cup Championship and former Head Coach of the New York Dragons, the Iowa Barnstormers and Arkansas Twisters of the Arena Football League. Coach Gregory was the Head Coach of the Iowa Barnstormers when Coach Haege was the Defensive Coordinator, Line Coach and Player Personnel Director for the Barnstormers and he was the Head Coach of the Arkansas Twisters when Coach Haege was the Arkansas Twisters Defensive Coordinator. 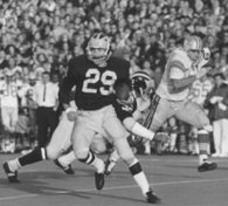 Here is Coach Haege's all-time favorite player, Barry Pierson from St. Ignace Michigan, when he played for the University of Michigan, running a punt back 63 yards to the Ohio State 3 yard line and helping Michigan to defeat Ohio State and end Ohio State's 22 game winning streak on Nov. 22nd,1969. Coach Haege coached Barry Pierson at St. Ignace High School in Michigan in 1963 and 1964. Coach Haege sent Barry Pierson's newspaper clippings down to the University of Michigan after every game, hoping the University of Michigan would give him a chance to play. They are very happy they did! Barry Pierson also intercepted 3 passes that day. ​Bret Bielema, former Head Football Coach at the University of Wisconsin and current Head Football Coach at the University of Arkansas. Coach Haege coached Bret Bielema when Coach Bielema played for the Milwaukee Mustangs of the Arena Football League in 1994. 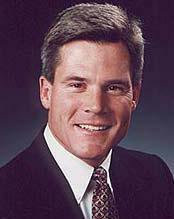 Stu Voight, former Minnesota Viking's tight-end, who was named to the Vikings all-time team. Coach Haege coached Stu Voight at the University of Wisconsin in 1969 when Coach Haege was the University of Wisconsin's Offensive Line Coach. Stu Voight introduced Coach Haege to former Minnesota Vikings Head Coach Jerry Burns as "the guy who taught me how to block." That's an awesome compliment there! Lloyd Carr, former Head Football Coach for the University of Michigan. Lloyd Carr was the QB at Northern Michigan University when Coach Haege was a Graduate Assistant Defensive Backs Coach at Northern Michigan University in 1966. John Harrington: Played on the 1980 Olympic Gold Medal winning hockey team. He played high school football for Coach Haege in Virginia Minnesota in 1973 and 1974. When giving talks to people after he won the Olympic Gold Medal, people would ask him "who is the best coach that you ever had? Assuming that he would say Herb Brooks. He says in which sport? John Harrington says Art Haege is the best coach that he ever had. That is one of the best compliments Coach Haege could ever get! Andy McCollough: Starting Offensive Guard and Center for the St. Louis Rams in the 1990's and the New Orleans Saints. Coach Haege coached him when Coach Haege was the head coach of the Milwaukee Mustangs of the Arena Football League in 1994. Coach Haege moved him from guard to center, and the New Orleans Saints signed him as a center. 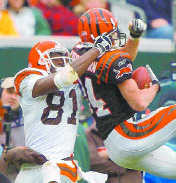 Kevin Kaslihorn, former starting defensive back for the Cincinatti Bengals.He played for Coach Haege when Coach Haege was the Defensive Coordinator for the Iowa Barnstormers of the Arena Football League in the late 1990's. 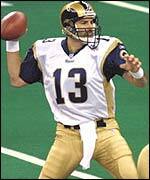 Kurt Warner: The QB for the Iowa Barnstormers of the Arena Football League when Coach Haege was the Iowa Barnstormer's Defensive Coordinator, Line Coach, and Player Personnel Director from 1995 until 2000 was former NFL QB Kurt Warner. Kurt Warner played for the Iowa Barnstormers in 1995, 1996, and 1997. Congratulations to Kurt Warner for making the NFL Hall of Fame! Coach Haege also coached with Kirk Mee, who was the Player Personnel Director for the Washington Redskins of the NFL in their Super Bowl days in the 1980's, when they both coached at the University of Wisconsin in 1969. Coach Haege was hired by Green Bay Packer legend Forrest Gregg to be the Offensive-Line Coach for Shreveport of the Canadian Football League in 1994 when Shreveport Louisiana had a CFL team. But Coach Haege decided to stay as the Head Coach of the Milwaukee Mustangs of the Arena Football League in 1994. Coach Haege was also one of the featured speakers at long-time NFL Offensive-Line Coach Jim Mcnally's football coaching clinic when Jim Mcnally was the Offensive-Line Coach for the Cincinnati Bengals in the early 1990''s. Lou Saban, Coach Haege played for the legendary Lou Saban when Coach Saban was the Head Football Coach of the Boston (now called New England) Patriots in 1960 and 1961 and Coach Saban hired Coach Haege to be his Defensive Coordinator for the Milwaukee Mustangs of the Arena Football League in 1994. Coach Saban was the Head Coach of the Buffalo Bills of the NFL, the University of Miami-Florida and many numerous other NFL, college, and high school football teams.